Acupuncture is the key component of today’s Traditional Chinese Medicine. It involves the insertion of extremely thin needles through your skin at strategic points on your body. Most patients come to Acupuncture to treat pain, however any medical problem can be addressed using Acupuncture. The easiest way to understand Acupuncture is when it comes to the treatment of pain. After an injury the pain signals from the peripheral nervous system reach the central nervous system and there are specific pain areas established in the brain involved in chronic pain. According the gate theory a complex interplay of peripheral and central nervous system is initiated. A neurogenic "highway" is established between the brain and the site of injury. It is the brains' job to "protect" the area of concern and start a healing process. However this process is often COUNTER-PRODUCTIVE due to failure of the repair process. The Acupuncture breaks this vicious cycle and down regulates the inflammatory process. Needles are not locally inserted into the pain areas but in corresponding "distal" locations. When this process is repeated several times in course of weeks or month, the pain center in the brain reverses and disappears and so does the chronic pain. This study from individual patient data meta-analyses of nearly 18,000 randomized patients on high quality trials provide the most robust evidence to date that acupuncture is a reasonable referral option for patients with chronic pain. When answering this complex question of how acupuncture works, one has to consider the conditions that are being treated. However no condition exists on its own. Only treating the body as whole will truly address the state of health. Everything is connected as a whole body! Below you will find some links to trusted websites if you are interested in a deeper understanding of Chinese Medicine and Acupuncture. Please start by reading through these excellent pages. For more in-depth research you can look at the Journal of Chinese Medicine, the Journal of Traditional Chines Medicine or do your own research at the National Center for Biotechnology information. 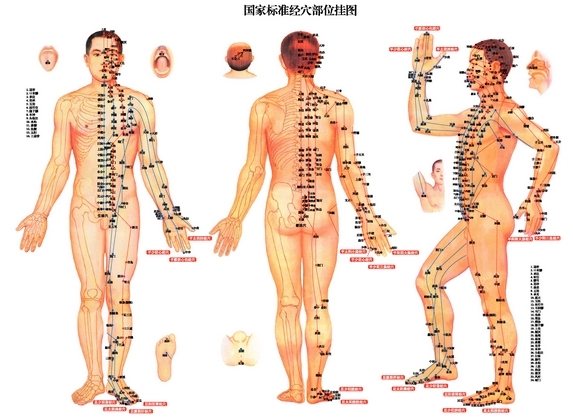 You are probably asking yourself how the acupuncturist knows the precise location of the acupuncture points. Picture a road map: a profusion of points woven into a web by lines of travel. Now imagine this 2-D system as 3-D in your body: a vast network of invisible energy pathways connecting to each other and to every atom, cell, tendon, bone, organ, each centimeter of skin—everything in your body! They link the upper portion with the lower and the surface with the interior, so that nothing is truly separate. Now add other dimensions to this 3-D interconnected body “map”: your mind, your emotions, and spirit—everything conscious and unconscious within you. These amazing pathways are the meridians, and they form your body and all invisible aspects of your being into an intercommunicating whole. Each of the regular Meridians are associated with an Element or Zang-Fu organ. E.g. the Liver channel starts between the 1st and 2nd toe and runs up on the inside of the leg up to the chest and connects to the Liver. Along this Liver Meridian pathway are 14 known Acupuncture points where the Qi appears to be easier accessible, each with different function. There are twelve major meridians that run on each side of the body, one side mirroring the other. Each meridian corresponds to a different internal organ. And each organ, with its own physiological and invisible energy functions, is not only dependent on the other organ systems but also on the greater meridian network. At NatureWorks Acupuncture you we offer a variety of Acupuncture styles ranging from Chinese to Japanese techniques. Every individual patient is assessed as to what approach is the best to achieve healing. Some conditions require local needles and some require the Tan style distal needling. Some patients are more responsive to chinese needling, some more to non-insertion Japanese styles. We even offer trigger point needling or japanese electro-diode techniques. Moxibustion, Cupping and Gu Sha are excellent options to deal with chronic pain problems.